Blogs for Borders IS NO LONGER UPDATED! America is awakened to the insane policies of illegal immigration, amnesty, unsecure borders opposed by bloggers dedicated to American sovereignty. -- Original Feed! Facebook Group Still Active! Join Us! First of all, Janet Napolitano personifies the “Peter Principle”, which states that government officials enjoy promotion to their highest level of incompetence. As Arizona’s governor, she watched her state become a major expressway for illegal aliens. She did nothing to stop the invasion. She stood paralyzed while Phoenix became the carjacking capitol of the world with 57,000 cars stolen annually. Illegals overran Arizona’s schools, medical systems and prisons. Drugs and lay-up houses flourished. National Park Ranger Kris Eggle suffered death by being gunned down by drug runners at Organ Pipe National Monument. Thousands of tons of trash accumulated on the land from illegals storming the border. Citizens like Kathy McKee and Russell Pearce pushed for Proposition 200 to stop the invasion. Anti-illegal immigration groups formed to stop the incursion. Sheriff Joe Arpaio battled to arrest, prosecute and deport illegals, but found Napolitano his biggest obstacle. Rusty Childress created ImmigrationBuzz.com to stop illegals from invading Arizona communities. Yet, Janet Napolitano never enforced it, never pursed it and never served Arizona citizens. She never engaged federal authorities to enforce the law. Neither did Senators McCain and Kyle. Thus, illegal aliens, along with traffickers and employers, knowing they would not be prosecuted---created an underground bus system equaling Greyhound Bus Lines. Traffickers delivered their illegal labor contraband to all points across the USA. While that phenomenon grew, Mayors from over 30 cities in America enacted “Sanctuary Policy” for illegal aliens. Mayor Webb of Denver joined and his sanctuary policy continues with Mayor John Hickenlooper. Criminal aliens may be arrested as many as five to 19 times, but never deported as in the case of illegals like Garcia Gomez who killed Denver Officer Donald Young or recently, illegal Francis Hernandez, arrested and let go 19 times, until he killed two women and a three year old child licking his ice cream at a Baskin and Robbins. In San Francisco, an illegal named Ramos, shot and killed a father and two sons at a stop light for no reason other than his own road rage. Mayor Gavin Newsome continues to provide “Sanctuary Policy” for illegals in the Golden Gate City. Thousands and thousands of criminal cases occur against Americans across the nation in sanctuary cities from San Francisco to Chicago to New York City. What would solve all of the murders, ID forgeries, ID fraud, illegal employment, loss of tax revenues, anchor babies, degraded schools, overloaded prisons, rapes, shoplifting, home burglaries, drunk driving, unlicensed and uninsured drivers, and criminal activity with 20 million illegal aliens now residing within America? Logical, rational and common sense dictates that Napolitano engage ICE agents across the nation to arrest, prosecute and jail employers of illegal aliens. How simple! How astute! How effective! Once employers of illegals see a methodical sweep across the nation with some of their comrades-in-crime walking out of buildings in shackles, a transformation toward law and order would prevail. Illegal aliens would self-deport on their own dime back to their own countries. In the meantime, Americans would discover jobs at a living wage! English would flourish once again as Americans worked the jobs that Americans have always worked. What a concept! Additionally, Americans pay for over 572,000 military personnel languishing on 700 bases in 120 countries around the world. By bringing back 50,000 of them to stand guard on our southern border would secure our borders within a month! Additionally, their presence would stop the $75 to $100 billion drug trade crossing our borders annually. WHAT STOPS SUCH REASONABLE ACTION TO SECURE OUR BORDERS AND REGAIN OUR COUNTRY? A few people in high places make a lot of money off our 21st century slave labor force. Corporations that employ millions of illegals -- make obscene profits. At the same time, we taxpaying American citizens, according to the Edwin Rubenstein Report, pay out $346 billion annually across 15 federal agencies to pay for illegal aliens. We suffer degraded schools with 50 to 76 percent dropout rates. Our medical systems bankrupt. Our prisons overflow with illegals. Until Americans elect governors, mayors and Congressional reps to uphold our laws, we can expect more of what has degraded our civilization in the past 30 years. We’ll also find ourselves in deeper water and consequences as legal and illegal immigration add another 100 million people within 25 years. Our apathy and stupidity will prove our downfall as a civilization. Tags: immigration enforcement, Janet Napolitano, borders, border security To share the post, click on "Post Link." Please mention / link to Blogs for Borders. Thanks! Highly paid PR firms for the open-borders lobby have gotten stories in many major newspapers this month suggesting that the only way to attract the Hispanic vote is to favor a comprehensive amnesty and also an increase in foreign workers. But a massive Zogby poll shows Hispanic views to be quite different . . . Tags: Hispanics, immigration, NumbersUSA, Roy Beck To share the post, click on "Post Link." Please mention / link to Blogs for Borders. Thanks! NumbersUSA: The Senate passed legislation that is the first part of a Jobs package aimed at helping America's 15 million unemployed. But the first bill, H.R.2847, will offer tax credits to employers who hire new workers, including illegal aliens. The Senate voted 70-to-28, passing the $15 billion jobs package, including a $13 billion tax incentive for employers who hire new workers. The component of the bill exempts employers from paying payroll taxes if the new hire has been recently unemployed. The bill does not require the employers to use E-Verify, so employers could receive tax incentives for hiring illegal aliens. The bill will head to the House for its approval of the Senate version. The Senate is expected to begin work on a much larger jobs package next week, and Ranking Member of the Senate Judiciary Committee Jeff Sessions and seven other Senators have already expressed their desire to include immigration related provisions in that bill. There's a new fax on the Action Board urging your Senators to protect American workers and legal immigrants who are already here by including provisions such as E-Verify. 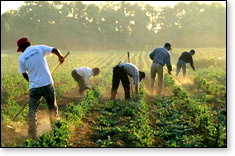 Tags: American jobs, illegal aliens, NumbersUSA To share the post, click on "Post Link." Please mention / link to Blogs for Borders. Thanks! 21 million illegal aliens are depending on you! Tags: illegal aliens, taxes, April 15, To share the post, click on "Post Link." Please mention / link to Blogs for Borders. Thanks! The gathering of conservatives from all walks of life at the recent Conservative Political Action Conference meetings brought to light at least one area where there is still a rift in the Republican agenda. Former Colorado congressman Tom Tancredo pointed out this deficiency, saying that CPAC 2010 failed the conservative movement in the “potent issues” of border security and illegal immigration. Furthermore, Tancredo accused CPAC board member Grover Nordquist of being soft on illegal immigrants. Nordquist is apparently working closely with what can be called an amnesty plan for illegals. Nordquist is also working on John McCain’s behalf over hardline, anti-illegal immigration supporter J.D. Hayworth. Illegal immigration must be considered as a threat to national security, and Republicans running for election or re-election in 2010 are foolish to ignore the issue. Bill Smith, Blogs for Borders Editor: While the issue of borders security was not a primary or even a secondary issue of CPAC this year, I recognize that there are many topics relevant to the largest ever number of Conservatives attending the CPAC event. While in I appreciate Former Representative Tom Tancredo for voicing his concern, I am kind of skeptical of his intent. Tancredo gave up his US House seat in 2008 instead of remaining in the U.S. House helping us on this and other issues. Republican presidential contender Tancredo appeared to basically "take his marbles and go home." While I have noted Grover Nordquist being somewhat irritating to many at times, he has remained in the game and has therefore has been able to define the parameters of the conservative discussions at least for CPAC. The writers and readers of this site do NOT and would NOT support any Amnesty efforts be they allegedly by Nordquist, McCain, or any other person. Americans and those in the legal immigration pipeline need jobs. It is time for illegals to go home. However, it will take far more than an "on again - off again" approach by Tancredo for us to accept him as "a voice" representing those who have remained concerned and involved in addressing Border Security and the invasion of the United States by illegal aliens. Tags: border security, CPAC, Grover Nordquist, Tom Tancredo, amnesty, illegal aliens To share the post, click on "Post Link." Please mention / link to Blogs for Borders. Thanks! Jim Kouri, columnist at The Examiner, says the Federal Reserve Bank is working hard to help illegal aliens send money back home. Kouri claims the Fed's intent is to integrate lawbreaking immigrants into the US banking system. Most such cash transfers are currently conducted using companies like Western Union, bypassing US banks. The Fed's new program, labeled "Directo a Mexico", is said to be designed to lower the costs of such transfers for illegals and concurrently benefit US banks. In his column, Kouri quotes a Wisconsin banker explaining the benefits to his industry. "People who didn't have bank accounts establish a relationship with us," said James Maloney, chairman of Mitchell Bank in Milwaukee, one of the first banks to offer the Federal Reserve Bank's remittance scheme, according to the Wall Street Journal, a newspaper that favors using illegal alien workers. "It's great for our business," said Maloney. The Examiner columnist points out the new customers of US banks will be required to show only a Matricular Consular card, which he says is known to be easily and often counterfeited. This ID card will qualify an illegal alien to open a bank account so s/he can send money home cheaply and safely. Doubtless, more customers and more accounts will benefit banks in the US, but Kouri points out the program's obvious (to everyone except the federal government apparently) benefit to drug traffickers. While on the surface this may appear to be a good idea for banks, it's an idea based on lawbreakers being given assistance in moving their money around. The Mexican drug trafficker will be able to take advantage of this new banking system as much as the illegal worker cleaning toilets. The program will make it easier for illegal immigrant drug dealers to export their ill-gotten gains to Mexico and other foreign countries. It will also make it easier for illegals already here to stay, it will encourage more to break our laws and cross our border looking for legitimate work, and it will make it easier and more profitable for those who import and sell drugs in the US. Exactly how does our government sell that as benefiting US citizens? Tags: border, Directo a Mexico, Drugs, Federal Reserve, Jim Kouri, Smuggling, The Examiner, Trafficking To share the post, click on "Post Link." Please mention / link to Blogs for Borders. Thanks! by Chris Chmielenski, NumbersUSA: It was another great week for us on the state level! Kentucky and Virginia each took big steps toward passing mandatory E-Verify for state agencies and contractors. And the Minnesota House approved an E-Verify amendment to a stimulus bill. Thanks to all our activists in these three states whose phone calls and faxes made a difference. Congress will be back in town next week, and the Senate will begin work on a Jobs bill, so make sure you check with us early next week for any faxing/calling opportunities to ensure jobs created go to American workers and legal immigrants. Three House Members have taken the lead on protecting American Jobs. Reps. Lamar Smith (R-TX), Gary Miller (R-CA) and Sue Myrick (R-NC) have formed the Reclaim American Jobs Caucus. Their goal is to raise public awareness of the connection between illegal immigration and unemployment, pressure the Obama Administration to vigorously enforce the laws against the employment of illegal aliens, work to implement legislation that will protect U.S. jobs from the impact of illegal immigration (especially to make E-Verify mandatory) and work to defeat legislation that will put U.S. jobs at risk from the impact of illegal immigration (especially to defeat amnesty). Tags: e-verify, Kentucky, Minnesota, Virginia To share the post, click on "Post Link." Please mention / link to Blogs for Borders. Thanks! Ten illegal aliens who were working as bricklayers at the new Cobb County Courthouse were fired after it was learned of their immigration status. Georgia is one of 10 states with a mandatory E-Verify law in place, requiring state agencies and contractors to use the workplace verification system. 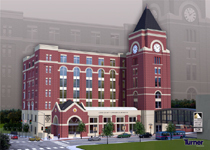 Turner Construction Company is overseeing the $63 million project that is funded by taxpayers. One of their subcontractors, Zebra Construction, failed to use E-Verify in hiring the bricklayers. The illegal aliens were detected when a member of "Jobs for Georgians" posed as a bricklayer and found that the illegal workers were being paid in cash for their work. The International Union of Bricklayers and Allied Craftworkers also contacted Zebra in November and were told that no paperwork needed to be submitted by the bricklayers before starting work and that they were being paid in cash. "Turner will continue to cooperate closely with the county and to monitor the employment eligibility of all workers on the project," Turner's Public Relations Manager Shannon Eckhart said in a released statement. Turner has hired a subcontractor to finish the masonry work, and the workers are being checked through E-Verify. For more information, see Atlanta's WGCL-TV and the Atlanta Journal Constitution. Tags: e-verify, Georgia, illegal aliens To share the post, click on "Post Link." Please mention / link to Blogs for Borders. Thanks! Judicial Watch: Fed up lawmakers in a Mexican border state plagued with huge numbers of illegal immigrants are increasingly taking matters into their own hands by passing laws to control the crisis long neglected by the federal government. Weeks after an Arizona State House panel approved a pair of measures intended to curb illegal immigration, the Senate has passed a law prohibiting sanctuary cities in the state. The measure allows illegal aliens to be charged with trespassing, makes it unlawful for anyone—documented or undocumented—seeking work to enter a vehicle stopped on the street and penalizes drivers who impede traffic in an attempt to hire a day laborer. The bill, which moves to the House for the crucial approval that could make it law, will also prohibit all state and local governments from adopting policies that restrict the enforcement of federal immigration measures. In fact, it requires state and local governments to comply with and assist in the enforcement of U.S. immigration laws. In the last few weeks Arizona House committees have endorsed similar measures to conquer the state’s colossal illegal immigration crisis which is good news for the pending Senate bill. The first prevents cities, counties and police departments from prohibiting law enforcement officers from enforcing immigration laws. The other requires criminal charges for day laborers and those who hire them if they impede the normal flow of traffic on public streets. Tags: Arizona, illegal aliens, sanctuary cities To share the post, click on "Post Link." Please mention / link to Blogs for Borders. Thanks! For the second year in a row, both sides of the illegal immigration debate agree that the illegal alien population is falling rapidly in America. The pro-Amnesty U.S. Department of Homeland Security says it is true and so does the pro-immigration enforcement group we support, Center for Immigration Studies (CIS). This new report for 2009, combined with the data from 2008, suggests a drop of 2 million in the illegal alien population of America. This proves a very important point! Enforcement instead of amnesty works, illegal immigration can be reversed, and there is no need for Comprehensive Immigration Reform Amnesty. While the Amnesty supporters cry that the bad economy alone is responsible for the rapid declines, we know that is only part of the equation. 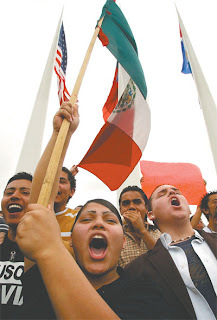 Evidence we have archived from government, media, and activist reports across America, indicate that local or state level immigration enforcement leads to gradual exoduses of illegal aliens. CBS Reports in "Number of Illegal Immigrants Plunges by 1M": The number of illegal immigrants in the U.S. has dropped by nearly 1 million, renewing the debate over what to do with those still in the country, according to a Los Angeles Times report Thursday. The Department of Homeland Security reported that illegal immigrant population dropped to 10.8 million in 2009 compared to 11.6 million in 2008. It was the second consecutive annual decline and the largest in at least three decades. "This represents a sharp break from the past, when pretty much the illegal population has continually grown," Steven Camarota, of the Center for Immigration Studies, a Washington, D.C., think-tank that favors immigration restrictions, told the paper. "It shows illegal immigration is not inexorable." Read the complete report According to the report, the downturn in illegal immigration is due in part to the bad economy, in which job opportunities have dried up. Homeland Security department spokesman Matthew Chandler told the paper that the U.S. had also deployed "unprecedented resources" to crack down on illegal immigration. The report renews a polarizing argument on how to address illegal immigrants' presence in the country. Those in favor of tougher immigration control say the report offers proof that illegal immigration is linked to job opportunities. Take away the jobs and illegal immigrants will leave the U.S.
"Whether jobs dry up because the government is doing enforcement or because of the recession, illegal aliens react in a rational manner: They either will not come or they'll go home," Ira Mehlman of the Federation for American Immigration Reform, told the paper. "It certainly shows that illegal immigration is a controllable phenomenon." . . . Among illegal immigrant groups, the Chinese population dropped by the largest percentage - nearly 50 percent. Mexicans, the largest illegal immigrant population, dropped 380,000 to 6.65 million. Declines occurred in most parts of the country, though it increased in Georgia. Arizona, Florida, New Jersey and New York all saw double-digit drops. Tags: border control, CBS, economy, illegal immigration, jobs, United States To share the post, click on "Post Link." Please mention / link to Blogs for Borders. Thanks! THE RIGHT TO CARRY YOUR COUNTRYS FLAG WHILE YOU PROTEST THAT YOU DONT GET ENOUGH RESPECT AND, IN MANY INSTANCES, YOU CAN VOTE. Tags: border control, border security To share the post, click on "Post Link." Please mention / link to Blogs for Borders. Thanks! WALL STREET JOURNAL — An Arizona sheriff said he planned to defy Washington's attempts to roll back his staunch enforcement of federal immigration law, a move that could put him on a collision course with the U.S. government. Late last year, U.S. Immigration and Customs Enforcement . 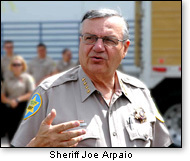 . . stripped Maricopa County Sheriff Joe Arpaio of the authority to use 100 of his deputies to enforce federal immigration in his jurisdiction, which includes Phoenix. The customs agency took the action because Mr. Arpaio's aggressive immigration crackdowns had drawn criticism from human-rights groups and had run afoul of the U.S. Justice Department, which is investigating whether he has used racial profiling and abused his authority.
. . . Mr. Arpaio said he would ignore Washington's effort to clip his powers and would train all of his 881 deputies to enforce federal immigration law on the streets. "We have the inherent right to enforce federal immigration law. . . . If Washington doesn't like it, I recommend they change the laws." . . . When it attempted to curtail Mr. Arpaio's authority, Washington limited his deputies' ability to verify the immigration status of people in the streets during the course of duty. The deputies still retain the authority to check the status of people booked into Maricopa County jails. "Since the Department of Homeland Security took away 100 of our federally trained deputies . . . we are going to train every sworn deputy to teach them how to enforce state and federal immigration laws," the sheriff said in a telephone interview. Tags: Arizona, ICE, illegal aliens, illegal immigrants, Joe Arpaio, Maricopa County, sheriff, Sheriff Arpaio To share the post, click on "Post Link." Please mention / link to Blogs for Borders. Thanks! Comments by Rep. Ted Poe on U.S. House Floor on 12/15/09 using the alleged trespass by "undocumented guests" at a White House party. Tags: border control, illegal immigrants, party crasher, satire, Ted Poe, US House, White House To share the post, click on "Post Link." Please mention / link to Blogs for Borders. Thanks! by TXPoet, Fort Hard Knox: The liberal left wing media, using Saul Alinsky’s guide, has portrayed the GOP as the Party of “NO”. I think it is about time the GOP actually do something positive. The GOP representatives in Congress for whatever reason seem to always be on the defense. They are reactive instead of being proactive. GOP initiatives, if they are being proposed, never see the light of the media nor the blogosphere. The few initiatives that we have heard about are “compromises” or proposals to counter initiatives by the other side. In the third article I offered some simple basic points that would reform the immigration laws. The only thing I would add to my previous reform proposals would be the repeal of the family reunification provisions of the 1965 Immigration and Nationality Act. If the GOP actually proposed reforms such as I have put forward they could actually get ahead of the power curve. If the GOP continues to sit back and do nothing they let the liberals dictate the terms. Tags: Immigration, reform, illegal immigration. To share the post, click on "Post Link." Please mention / link to Blogs for Borders. Thanks! by Jim Kouri, Worth Reading: While telling the American people that national security is a priority in his administration, President Barack Obama submitted a 2011 budget proposal that includes cuts to U.S. border security. The proposed budget cuts include a reduction in Border Patrol agents and a cut in the amount of money allocated for the so-called "virtual fence" on the U.S.-Mexico border, which critics claim is a pipe dream in lieu of a real border fence. In the midst of a firestorm over Homeland Security Secretary Napolitano's failure to appear before a Congressional committee hearing, officials from her office confirmed the proposed cuts on Monday.They said, however, that there would be no lay-offs of Border Patrol agents and the reduction in positions would be achieved through attrition as agents retire or transfer to other Homeland Security departments. In order to ward off vocal condemnation of this latest Obama proposal, White House officials claim the cuts won't reduce the effectiveness of the U.S. Border Patrol, which President George W. Bush doubled in size. At it's apex, there were more than 20,000 agents assigned to northern and southern borders. This latest White House attempt to reduce the amount of resources allocated for border protection will undoubtedly be met with resistance from the Senate and House of Representatives, who will be vote on proposed budget cuts, according to several national security experts. "The Republicans are expected to kick up a fuss over this latest effort to minimize the protection of U.S. borders. But, this is an election year and Democrats do not want to appear weak on security, especially when control of both houses of Congress is at stake," said former NYPD detective and Marine intelligence officer Sid Frances. "Look at it this way: New York City has a police department that numbers well over 40,000 officers and another 10,000 civilian employees, yet the U.S. Border Patrol agents, who are responsible for thousands and thousands of miles of border, number only 20,000. And Obama wants to cut that number," said Frances, now the owner of a private security firm. Obama's proposed budget cut also would eliminate $226 million that had been allocated for an electronic "virtual fence" system along the border. Known as "SBInet," the strategy is to install cameras, radar and sensors to detect humans and contraband coming into the U.S.
Obama White House officials told reporters that even though the President is seeking cuts in border programs, the administration is seeking an additional $10 million to create Border Enforcement Security Task Forces in Honolulu, San Francisco, and Massena, N.Y. These multi-agency teams work to identify and stop criminal organizations that transport drugs and other contraband across U.S. borders. "This is only the beginning," said political strategist Mike Baker. "There will be more cuts made to Immigration and Customs Enforcement since President Obama, House Speaker Nancy Pelosi and others have been critical of agents going after illegal workers. This budget is going to be all smoke and mirrors." Jim Kouri, CPP is currently fifth vice-president of the National Association of Chiefs of Police and he's a columnist for The Examiner (examiner.com) and New Media Alliance (thenma.org). In addition, he's a blogger for the Cheyenne, Wyoming Fox News Radio affiliate KGAB (www.kgab.com). Kouri also serves as political advisor for Emmy and Golden Globe winning actor Michael Moriarty. He's former chief at a New York City housing project in Washington Heights nicknamed "Crack City" by reporters covering the drug war in the 1980s. In addition, he served as director of public safety at a New Jersey university and director of security for several major organizations. He's also served on the National Drug Task Force and trained police and security officers throughout the country. Kouri writes for many police and security magazines including Chief of Police, Police Times, The Narc Officer and others. He's a news writer and columnist for AmericanDaily.Com, MensNewsDaily.Com, MichNews.Com, and he's syndicated by AXcessNews.Com. Kouri appears regularly as on-air commentator for over 100 TV and radio news and talk shows including Fox News Channel, Oprah, McLaughlin Report, CNN Headline News, MTV, etc. Tags: Barack Obama, border control, border fence, Federal Budget, Jim Kouri, national security To share the post, click on "Post Link." Please mention / link to Blogs for Borders. Thanks! Gary Bauer shared this note today: If higher energy taxes, socialized medicine, failed stimulus bills, union bailouts and homosexual rights aren’t enough to get your blood boiling, get ready for amnesty. New York liberal Chuck Schumer reportedly struck a deal with Harry Reid and the White House to pass an immigration reform bill by April. It’s just one more part of Obama’s “Big Bang” agenda that Democrats are desperate to ram through while they control Congress. I don’t make a habit of giving Democrats advice, but in a column at POLITICO today, I suggest that they might want to avoid digging the hole even deeper with yet another risky legislative move. by Gary Bauer, Contributing Author: Immigration reform may seem a distant priority for a ruling party that’s made the increasingly elusive goals of job creation and health care reform its primary focus in 2010. Nevertheless, President Barack Obama and top congressional Democrats have signaled that, as Obama said in his State of the Union address, “fixing our broken immigration system” remains at the top of their legislative To Do list before the midterm elections. But Democrats push immigration reform legislation, which would include amnesty for illegal residents, at their own peril. With employment persisting at 10 percent, addressing immigration risks reviving the grass-roots backlashes that have thus far defined the Obama presidency. Even before the president’s SOTU call to action, Sen. Chuck Schumer (D-NY), according to POLITICO, was “quietly spreading the word within the immigration community that he has the White House’s support to pass a bill by April.” Schumer reportedly struck a deal with Senate Majority Leader Harry Reid (D-NV) that he and other liberal Democrats would not push hard to include illegal immigrants under health care reform as long as the White House committed to starting an immigration overhaul effort this year. Undertaking immigration reform now would only slightly delay Obama’s promise to tackle immigration in his first year. It might also energize America’s 11 million Latino voters, including the 3 million Latinos who voted for the first time in 2008, ahead of what look like very difficult elections for Democrats. But it also would very likely provoke an intense grass-roots backlash. In 2007, when immigration reform was last debated, legislation that included amnesty looked likely to pass until many members of Congress went home to find deep opposition among their constituents. Concerned citizens — many of them conservatives, but also including independents and moderate Democrats — voiced their opposition to amnesty in town hall meetings across the country, insisting that enhanced border security was needed first. Largely because of the grass-roots pushback against amnesty, immigration reform failed. Today’s anti-amnesty backlash could be even more potent. For one thing, the American people are already in the mood to protest. As the tea party and town hall meeting protests showed, Americans across the ideological spectrum are fed up with a ruling party that’s out of step with their values and priorities. Part of the dissatisfaction stems from government bailouts of various industries that forced already financially strained taxpayers to foot the bill. In his SOTU address, Obama discussed reforming immigration laws in order to “ensure that everyone who plays by the rules can contribute to our economy and enrich our nation.” That’s an approach most Americans can support. But the Democrats’ proposal includes an immigration amnesty that would reward those who by definition did not play by the rules. Many Americans were furious over the bank and other industry bailouts because they intuitively understood that bailouts create moral hazards by rewarding bad behavior and incentivizing future bad behavior. Similarly, Americans recognize that granting amnesty to immigrants who entered the country illegally would reward an illegal act and offer future immigrants the incentive to do the same. Then there is immigration reform’s effect on the economy. When grass-roots resistance killed immigration reform in 2007, the national unemployment rate stood at 4.5 percent. Today, unemployment is in double digits. Many economists believe large-scale immigration would make matters worse. Immigration exerts downward pressure on wages at the bottom of the labor market. And unemployment is highest among those groups that compete with new immigrants for entry-level jobs: blacks (30%), teenagers (27%) and those without a high school degree (15%t). The problem is that immigrants are disproportionately low-skilled (most illegal immigrants do not have a high school degree) and poor. Heritage research has found that such immigrants “receive, on average, three dollars in government benefits and services for each dollar of taxes they pay.” Those benefits and services include Social Security, Medicare, education and most of the more than 60 means-tested federal welfare programs, including food stamps, public housing, Temporary Assistance for Needy Families and many more. In addition, Heritage research calculated that the cost of amnesty after amnesty recipients reach retirement would be $2.6 trillion. Just as Americans reacted strongly to an attempt to overhaul health care because of its effect on their pocketbooks and the federal debt, many Americans would reject immigration reform legislation that aggravates an already perilous economic situation. Instead of taking seriously grass-roots resistance to amnesty, we can expect the left to react as it did when tea party protests and town hall pushback became obstacles to legislative success: to ignore or dismiss resistance to its agenda, then to attribute anger to ignorance or racism. Far from being inspired by xenophobia or lack of compassion, however, opposition would come from Americans of all political stripes concerned about their jobs and a government increasingly willing to bail out those who do not play by the rules. If Democrats are serious about reforming immigration, they should propose legislation that strengthens border security and cracks down on illegal hiring. A viable bill would also focus on promoting legal entry of highly skilled workers, who would be strong contributors to the government’s finances. It would also create a system of legalization that’s conditioned on verifiable reductions in the levels of illegal migration. By pushing immigration reform, Democrats would provoke a grass-roots backlash that would build momentum going into the November elections. It would also allow conservatives to credibly argue that Democrats are placing partisan politics ahead of economic concerns, thus deepening the already pervasive disillusionment with Democratic-controlled Washington. Gary Bauer is is a conservative family values advocate and serves as president of American Values and chairman of the Campaign for Working Families. He submitted this article to the ARRA News Service Editor which also appears in his column in Politicol. Bauer was a former Republican presidential candidate and served as President Ronald Reagan’s domestic policy adviser. Tags: amnesty, Barack Obama, Charles Schumer, costs, Democrats, Gary Bauer, Harry Reid, illegal aliens, illegal immigration, illegal workers, immigration, immigration reform, Obama Administration To share the post, click on "Post Link." Please mention / link to Blogs for Borders. Thanks! Salute to Denmark. This could very well happen on our Continent! Susan MacAllen, a contributing editor for Security Matters: Salute the Danish Flag - it's a Symbol of Western Freedom By Susan MacAllen. In 1978-9, I was living and studying in Denmark. But in 1978 - even in Copenhagen, one didn't see Muslim immigrants. The Danish population embraced visitors, celebrated the exotic, went out of its way to protect each of its citizens. It was proud of its new brand of socialist liberalism one in development since the conservatives had lost power in 1929 - a system where no worker had to struggle to survive, where one ultimately could count upon the state as in, perhaps, no other Western nation at the time. Denmark was also most generous in its immigration policies - it offered the best welcome in Europe to the new immigrant: generous welfare payments from first arrival plus additional perks in transportation, housing and education. It was determined to set a world example for inclusiveness and multiculturalism. How could it have predicted that one day in 2005 a series of political cartoons in a newspaper would spark violence that would leave dozens dead in the streets -all because its commitment to multiculturalism would come back to bite? By the 1990's the growing urban Muslim population was obvious - and its unwillingness to integrate into Danish society was obvious. Years of immigrants had settled into Muslim-exclusive enclaves. As the Muslim leadership became more vocal about what they considered the decadence of Denmark 's liberal way of life, the Danes - once so welcoming - began to feel slighted. Many Danes had begun to see Islam as incompatible with their long-standing values: belief in personal liberty and free speech, in equality for women, in tolerance for other ethnic groups, and a deep pride in Danish heritage and history. It is easy to understand why a growing number of Danes would feel that Muslim immigrants show little respect for Danish values and laws. An example is the phenomenon common to other European countries and Canada: some Muslims in Denmark who opted to leave the Muslim faith have been murdered in the name of Islam, while others hide in fear for their lives. Jews are also threatened and harassed openly by Muslim leaders in Denmark, a country where once Christian citizens worked to smuggle out nearly all of their 7,000 Jews by night to Sweden - before the Nazis could invade. I think of my Danish friend Elsa - who, as a teenager, had dreaded crossing the street to the bakery every morning under the eyes of occupying Nazi soldiers - and I wonder what she would say today. If you wish to become Danish, you must attend three years of language classes. You must pass a test on Denmark 's history, culture, and a Danish language test. You must demonstrate an intent to work, and have a job waiting. If you wish to bring a spouse into Denmark, you must both be over 24 years of age, and you won't find it so easy anymore to move your friends and family to Denmark with you. You will not be allowed to build a mosque in Copenhagen. Although your children have a choice of some 30 Arabic culture and language schools in Denmark, they will be strongly encouraged to assimilate to Danish society in ways that past immigrants weren't. 'The calculations of the welfare committee are terrifying and show how unsuccessful the integration of immigrants has been up to now,' he said. The Muslim reply came soon after. Her house was torched while she, her husband and children slept. All managed to escape unharmed, but she and her family were moved to a secret location and she and other ministers were assigned bodyguards for the first time - in a country where such murderous violence was once so scarce. And meanwhile, Canadians clamor for stricter immigration policies, and demand an end to state welfare programs that allow many immigrants to live on the public dole. As we in Canada look at the enclaves of Muslims amongst us, and see those who enter our shores too easily, dare live on our taxes, yet refuse to embrace our culture, respect our traditions, participate in our legal system, obey our laws, speak our language, appreciate our history....we would do well to look to Denmark and say a prayer for her future for our own. Tags: Canada, Denmark, immigration, Muslim immigrants, Security Matters To share the post, click on "Post Link." Please mention / link to Blogs for Borders. Thanks! Illegal Immigration & Amnesty Issues Takes Center Stage in 2010 Elections! ALIPAC: Illegal Immigration will be one of the top issues fueling a historic political backlash in the 2010 elections and Americans for Legal Immigration PAC (ALIPAC) is launching their endorsement campaigns early this cycle with an unprecedented 65 candidates from 17 states in the first wave. This initial group of endorsed candidates represent incumbents in Congress that ALIPAC has supported in 2006 or 2008 and challengers the organization supported in 2008 that lost by narrow margins. Candidates are selected and endorsed, if ALIPAC's research indicates they are aligned with the popular views of voters on immigration issues as measured by scientific and certified polls archived at alipac. us, which indicate a super majority of Americans support immigration and border enforcement instead of comprehensive path to citizenship amnesty. ALIPAC has launched candidate endorsement and support efforts earlier in the election year than ever before for three reasons. One, the 2010 elections are expected to help defeat the Comprehensive Immigration Reform AMNESTY legislation H.R. 4321 supported by President Obama, Congressman Luis Gutierrez (D-IL) and 90 Democrats in the House. Two, Republican and Democratic leadership out of DC are working overtime to try and field candidates who support the same Globalist agenda to trap voters and deprive them from a true choice on immigration issues. Three, ALIPAC intends to contribute more funds, send in more volunteers, and promote endorsements online, more than ever before. "Americans are going to get one last chance to get things right at the ballot box in 2010" said William Gheen. "Many of us have fought hard to stop these nation destroying Amnesty bills to give voters one more chance to get it right. American citizens must rise up and lead the way for a peaceful and historic political revolution in 2010." ALIPAC is encouraged by the recent victory of Scott Brown in Massachusetts where Brown made it very clear he opposed any form of Amnesty for illegal aliens and favored immigration enforcement instead as one of his top issues listed on his campaign website. ALIPAC would like to see many candidates state their opposition to the Obama and Gutierrez supported Amnesty bill HR 4321 in their campaign materials. Tags: 2010 Elections, ALIPAC, amnesty, illegal immigration, illegal aliens To share the post, click on "Post Link." Please mention / link to Blogs for Borders. Thanks! Former Contributors: Dr. Bill Smith, Editor - "Ozark Guru"
Send Immigration Views to Congress"
Comments by contributors or quotes sources do not necessarily reflect the position of other contributors or the Editors. Fair Use: This site / blog may contain copyrighted material the use of which has not been specifically authorized by the copyright owner. Such material is made available to advance understanding of political, human rights, economic, democracy, and social justice issues, etc. This constitutes a 'fair use' of such copyrighted material as provided for in section Title 17 U.S.C. Section 107 of the US Copyright Law. Per said section, the material on this site/blog is distributed without profit to readers to view for the expressed purpose of viewing the included information for research, educational, or satirical purposes. Any person / entity seeking to use copyrighted material on this site / blog for purposes that go beyond "fair use," must obtain permission from the copyright owner.